We won the Grand Gold Medal at The Fine Sake Awards Japan 2018! 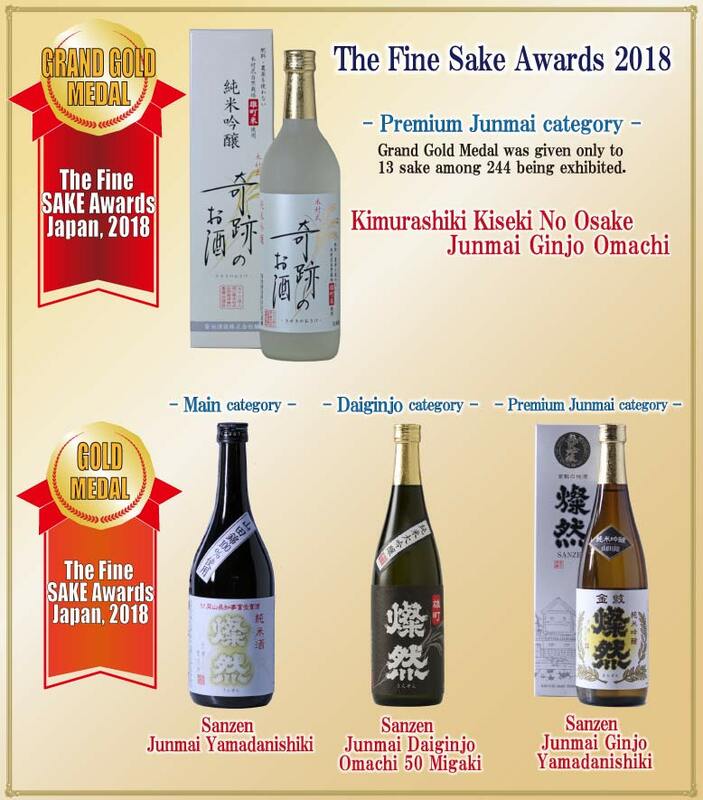 Our Sake "Kimurashiki Kiseki No Osake Junmai Ginjo Omachi" won the Grand Gold Medal at The Fine Sake Awards Japan 2018 on 20th February. This sake uses the naturally cultivated Omachi rice produced in Okayama Pref., and can enjoy rich taste with mellow fragrance. Omachi is rice which has high rarity value and is one of the most suitable for brewing. Also, we got the Gold Medal for "Sanzen Junmai Yamadanishiki", "Sanzen Junmai Daiginjo Omachi 50 Migaki", and "Sanzen Junmai Ginjo Yamadanishiki" at the same Awards. We are very proud of, and appreciate all of you. We wish you enjoy these one with wineglasses. We will also make an effort for the remainder of this season, thank you.